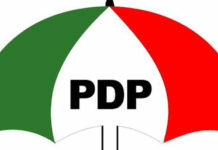 One of the aspirants for the National Chairmanship position of the Peoples Democratic Party, PDP, Chief Bode George, has withdrawn from the race. George is among the nine contenders jostling for the position. Bode George, a member of PDP Board of Trustees, made this announcement during a conference in Abuja on Friday. He insisted that he did not step down for another candidate and also raised concerns about the fallout of the outcome of the convention. According to him, he withdrew because the South West is already cheated with the entrants of aspirants from the South-South. George made it clear he stands with the micro-zoning principal of the party, which has been abandoned. He also blasted Rivers Governor, Nyesom Wike, for abusing the Yoruba people on a national television, when he said the South West has never contributed anything meaningful to the success of the PDP.